We will be watching an edited version of the 1989 movie Glory, (starring Matthew Broderick and Denzel Washington) in their history class next week. The purpose of the movie is to help students visualize the historical participation of African-American soldiers in Civil War combat. 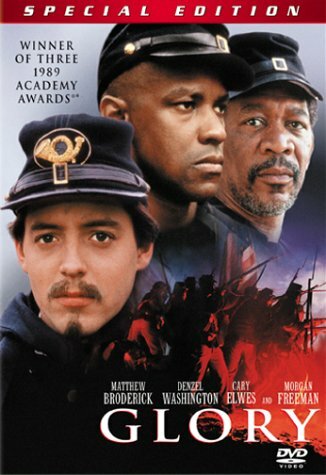 The movie is based on two books, Lay This Laurel by Lincoln Kirstein and One Gallant Rush by Peter Burchard, as well as the letters of Robert Gould Shaw, the 25-year-old son of Boston abolitionists who volunteered to command the all-black 54th Regiment of the Massachusetts Volunteer infantry. What weapon do you see many Union soldiers using? What weapon is making this a deadly battle? In 1862, how are African Americans participating in the war? What were war-time hospitals like? Did Frederick Douglass support the creation of an all-black regiment of soldiers? Why do you think whites were afraid of giving guns to Blacks? What are the differences in the African Americans that form the company? According to the announcement read in the rain by Colonel Shaw, what will be the consequence for the 54th regiment if they are captured by the South? Why did Colonel Shaw say “Glory Hallelujah.” In the morning after the announcement? When Pvt. Sharts is firing his weapon, Colonel Shaw begins yelling at him. It seems he is doing this to be mean. What is he trying to teach the men and his officers? Why can’t the company get shoes? Why does Denzel’s character get whipped? How does Colonel Shaw get shoes? The 54th Regiment meets another regiment of black soldiers. How are these two regiments different? Why does Colonel Shaw choose to set fire to the town? Why do you think it is so important to Thomas that he not be sent back? What is the name of the fort the North wants to capture? What does Robert volunteer his men to do? Why has the attitude of the white soldiers changed by the beginning of this scene? What is Robert’s last request to the reporter? Why does he think this is so important? • Why is Robert participating in this war? • What weapon do you see many Union soldiers using? • What weapon is making this a deadly battle? • In 1862, How are African Americans participating in the war? • What is the Emancipation Proclamation? • What were war-time hospitals like? • Did Frederick Douglass support the creation of an all-black regiment of soldiers? • Why do you think whites were afraid of giving guns to Blacks? • What are the differences in the people that form the company? • What are the signs of racism you see within the army? • What does Colonel Shaw’s letter show about his feelings towards his troops? • According to the announcement read in the rain by Colonel Shaw, what will be the consequence for the 54th regiment if they are captured by the South? • Why did Colonel Shaw say “Glory Hallelujah.” In the morning after the announcement? • When Pvt. Sharts is firing his weapon, Colonel Shaw begins yelling at him. It seems he is doing this to be mean. What is he trying to teach the men and his officers? • Why can’t the company get shoes? • Why does Denzel’s character get whipped? • How does Colonel Shaw get shoes? • The 54th Regiment meets another regiment of black soldiers. How are these two regiments different? • Why does Colonel Shaw choose to set fire to the town? • Why do you think it is so important to Thomas that he not be sent back? • What is the name of the fort the North wants to capture? • What does Robert volunteer his men to do? Follow-up Question: Why would he volunteer his men for such a dangerous mission? • Why has the attitude of the white soldiers changed by the beginning of this scene? • What is Robert’s last request to the reporter? Why does he think this is so important? Choose one of the discussion questions below and write at least two body paragraphs (with evidence from the film) to answer the question. You will use this writing in a class discussion of these questions. • Many characters begin this film with negative feelings about people from other races. Which character changes their perceptions of other races the most? • Do these soldiers die for nothing? • Given the examples of racism against the 54th throughout the film, how do you think African-Americans will be treated by the North after the war? 1. Beginning with “Do these soldiers die for nothing?” Student can share out responses. Even if students have not drafted on this topic, they are free to participate. 2. Given the pervasive racism against the 54th, how do you think African-Americans will be treated after the War?